Evolang is busy this year – 4 parallel sessions and over 50 posters. We’ll be positing a series of previews to help you decide what to go and see. If you’d like to post a preview of your work, get in touch and we’ll give you a guest slot. 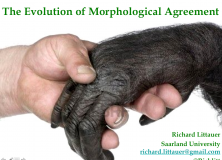 In this talk I’m basically outlining the debate as I see it about the evolution of morphology, focusing on agreement as a syntactic phenomenon. There are three main camps: Heine and Kuteva forward grammaticalisation, and say that agreement comes last in the process, and therefore probably last in evolution; Hurford basically states that agreement is part of semantic neural mapping in the brain, and evolved at the same time as protomorphology and protosyntax; and then there’s another, larger camp who basically view agreement as the detritus of complex language. I agree with Hurford, and I propose in this paper that it had to be there earlier, as, quite simply put, there is too much evidence for the use of agreement than for its lack. Unfortunately, I don’t have any empirical or experimental results or studies – this is all purely theoretical – and so this is both a work in progress and a call to arms. Which is to say: theoretical. First, I define agreement and explain that I’m using Corbett’s (who wrote the book Agreement) terms. This becomes relevant up later. Then I go on to cite Carstairs-McCarthy, saying that basically there’s no point looking at a single language’s agreement for functions, as it is such varied functions. It is best to look at all languages. So, I go on to talk about various functions: pro-drop, redundancy, as an aid in parsing, and syntactic marking, etc. Carstairs-McCarthy is also important for my talk in that he states that historical analyses of agreement can only go so far, because grammaticalisation basically means that we have to show the roots of agreement in modern languages in the phonology and syntax, as this is where they culturally evolve from in today’s languages. I agree with this – and I also think that basically this means that we can’t use modern diachronic analyses to look at proto-agreement. I think this is the case mainly due to Lupyan and Dale, and other such researchers like Wray, who talk about esoteric and exoteric languages. Essentially, smaller communities tend to have larger morphological inventories. Why is this the case? Because they don’t have as many second language learners, for one, and there’s less dialectical variation. I think that today we’ve crossed a kind of Fosbury Flop in languages that are too large, and I think that this is shown in the theories of syntacticians, who tend to delegate morphology wherever it can’t bother their theories. I’m aware I’m using a lot of ‘I think’ statements – in the talk, I’ll do my best to back these up with actual research. Now, why is it that morphology, and in particular agreement morphology, which is incredibly redundant and helpful for learners, is pushed back after syntax? Well, part of the reason is that pidgins and creoles don’t really have any. I argue that this doesn’t reflect early languages, which always had an n-1 generation (I’m a creeper, not a jerk*), as opposed to pidgins. I also quote some child studies which show that kids can pick up morphology just as fast as syntax, nullifying that argument. There’s also a pathological case that supports my position on this. And that sums up what my talk will be doing. Comments welcomed, particularly before the talk, as I can then adjust accordingly. I wrote this fast, because I’ll probably misspeak during the talk as well – so if you see anything weird here, call me out on it. Cheers. *I believe in a gradual evolution of language, not a catastrophic one. Thank Hurford for this awesome phrase. Carstairs-McCarthy, A. (2010). The Evolution of Morphology. Oxford, UK: Oxford University Press. Corbett, G. (2006). Agreement. Cambridge, UK: Cambridge University Press. Heine, B., and Kuteva, T. (2007). The Genesis of Grammar. Oxford, UK: Oxford University Press. Hurford, J.R. (2002). The Roles of Expression and Representation in Language Evolution. In A. Wray (Ed.) The Transition to Language (pp. 311–334). Oxford, UK: Oxford University Press. Lupan, G. & Dale, R (2009). Language structure is partly determined by social structure Social and Linguistic Structure. Whenever I think about these ‘what evolved first’ questions, I’m always tempted to consider the co-evolution alternative. Mike Dowman has a recent modelling paper which demonstrates that the synthetic/analytic dichotomy of the evolution of syntax may be more of a graded scale. In his models, languages emerge that are neither fully holistic or fully synthetic. Also, see Tessa Verhoef’s evolang preview. Furthermore, it seems that these kinds of arguments rely on a single route of evolution – that there was one population in which stages evolved together. Since you mention Lupyan & Dale and the exoteric/esoteric niches (by the way, the cause of the link between morphology and population size is in dispute – see Hannah’s post, and her recent experiment on foreigner-directed speech), is it possible that the order of the evolution of agreement arose in different orders in different populations, and then was combined into a single language through contact? See also, my post on resolving the synthetic/analytic debate. Perhaps the evidence from pidgins speaks against this? Although the synthetic/analytic debate is about the evolution of syntax, not of morphological agreement, the arguments for the synthetic route are similar to yours above: Ontogeny reproducing phylogeny, pidgins, impairment as fossils. However, Bickerton also points to the abilities of other primates as evidence of lexical abilities without syntax. Is there evidence that primates can handle agreement? There are the AnBn tests, although the methodologies have been criticised. Also, you mention pro-drop above. However, the ability to use pro-drop correctly often develops much later in children than other morphological agreement abilities (e.g. Snyder,Senghas & Inman, 2001). However, pro-drop may be different from other agreement phenomena. Antonella Sorace sees pro-drop as an interface phenomenon – it must be processed on-line by combining information from the syntactic and pragmatic domains (see Sorace, 2011).